Home Sampler Cross Stitch Pattern to print online. 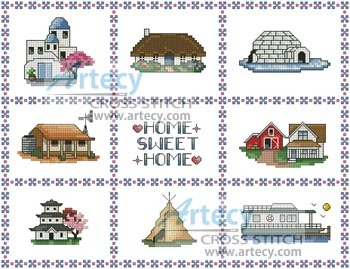 This counted cross stitch pattern of a Home Sampler was designed by Artecy Cross Stitch. Stitch the whole design as a sampler or use the individual designs on ornaments, greeting cards etc. Full cross stitches, Quarter Stitches and Backstitching are used in this pattern. It is a black and white symbol pattern.